On 12 March we celebrate an event which has both historically changed the world and is key to creating and empowering its future. In March 1989, while at CERN, Tim Berners-Lee wrote his memo “Information Management: A Proposal” which outlined the World Wide Web. Arrived at via collaboration and consensus. Not limited to the browser but now the “Web of Everything”. Tim also notes: “As the late internet activist John Perry Barlow, once said: “a good way to invent the future is to predict it”. It may sound utopian, it may sound impossible to achieve after the setbacks of the last two years, but I want us to imagine that future and build it.” This is inspiring, indeed; both generally but also for the W3C and the Web. W3C is grateful to its Director and founder Tim Berners-Lee for his incredibly powerful and innovative invention. Today we celebrate our history with the Web as well as its future as, together with our members, editors and contributors, we are helping to shape what it will become. If you feel so inclined, join us in celebrating by sharing in comment your Web success story, or write your own blog post, or tweet about #HappyBirthdayWWW. Even the Web is a PISCES. We are the best! I’ve got just one question. Where should I send the birthday card too! Actually,scratch that! I think I’ll wait until next year when it’s the big 3 0 !!! Happy Birthday web! one of the greatest gift/curse to the world as we know it. We are connecting together in our organization with all best wishes in that day! We are all together who cannot live and function without The Web and we can only say that you helped us a lot in past couple of years. Thank you, happy anniversary and good luck in the future! 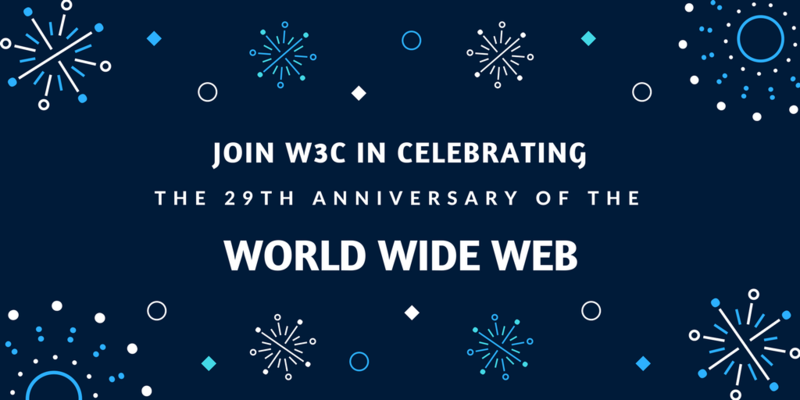 Happy 29th Web anniversary! Happy Birthday, WWW! That’s really amazing! I was born in 1988 and it’s so hard to imagine that we managed to live without the web. Today, it is such a casual thing to do something online. Things changed a lot since 1989. Happy birthday web! The king maker of rapidly changing software development world.